Apple announced a new MacBook computer this week, during a press event that also provided the release date and pricing details for the upcoming Apple Watch. Everyone seemed to agree that the MacBook is a beautiful thing. I wish I could be more delicate, but the MacBook impresses me as being a totally unnecessary product. It might be a good ‘casual user’ machine: sufficient for accessing the Web, watching (cat) videos and for short emails perhaps? But so is the iPad. It might be a good “Office” machine: good for making presentations, writing, working on budgets. But so is the MacBook Air, which is less expensive and much more powerful. Instead, Apple seems to have aimed it at the less expensive Chromebook Pixel. This was a major lost opportunity for Apple. It could have been the one form-factor that Apple is missing – the one that would have addressed the three things that the Microsoft Surface has over the iPad. The MacBook could have had a full computer operating system (as opposed to iOS), the ability to remove the keyboard portion so it could function as a tablet, and a port for file transfer and peripherals. 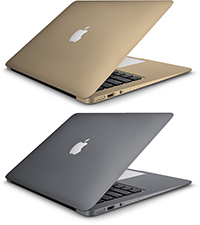 These could have made the MacBook an instant hit. Instead, it has a mobile processor and people are already complaining about the keyboard. I also immediately imagined a folder-like leather cover that would go behind the screen portion and under the keyboard portion. With the screen removed, the part of the cover that went behind the screen would simply fold down over the keyboard to protect it. My first impression of the Apple Watch is that its not something that was designed for the ages. Luxury watches are designed as heirlooms and have century-long life expectancies, not 18-months. Apple could still pull off a coup for $10,000-to-$17,000 Apple Watch Edition buyers if its Applecare extended warranty were to consist of replacing the electronics every couple of years. That would also reinforce the notion of Apple as a luxury brand. Or, instead of doing it under Applecare, just do it for free. The electronics probably cost less than $100 under mass production – the BOM (bill of materials) cost is probably much lower than a smartphone. iPhone 5S’ BOM was $199. It would be a pretty small percentage of the price. If Apple intended the new MacBook to be “jewelry,” it’s too big for a lady to carry in her pocketbook. And as for the Apple Watch. I imagine that it will sell, but not in Version 1.0. Too big. One of the appeals of the FitBit is its size and light weight. Once Apple manages to skinny down the electronics, then yes maybe.